On any given day 80,000 to 100,000 inmates in U.S. prisons, jails or juvenile detention facilities are in solitary confinement. The practice can cause long-term damage to the mental health of inmates. 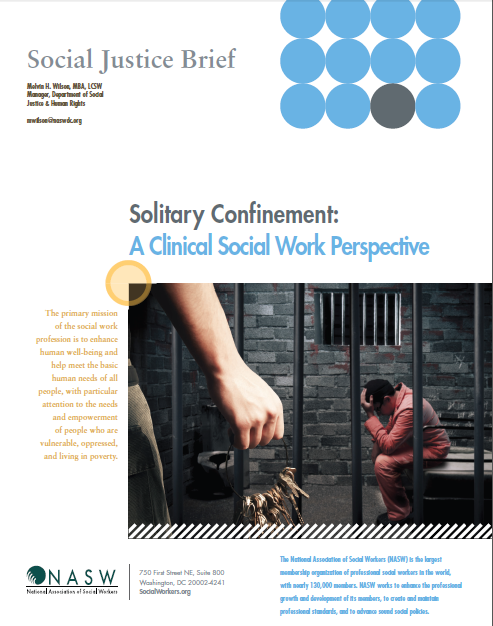 This Social Justice Brief from the National Association of Social Workers (NASW), Solitary Confinement: A Clinical Social Work Perspective, offers and overview of this issue. It urges social workers to advocate to end this destructive practice but also offers guidance on how social workers can help inmates who are currently in solitary confinement or have experienced it. For more information on this issue contact NASW Social Justice and Human Rights Manager Mel Wilson at mwilson@naswdc.org. Thank you to NASW for taking steps to bring attention to the issue of solitary confinement within our profession. I appreciate the information that is provided for educational purposes, however, having worked in a jail, I do not find this brief to be “A Clinical Social Work Perspective,” as it is titled. The brief certainly is informative, however it misses the mark in terms of the real ethical challenges faced by social workers in the correctional environment. I would like to offer a social work perspective. During my time working in a correctional setting, I felt tormented by the ethical dilemmas and challenges of dual loyalty that I was faced with on a daily basis. One being my obligation to assess for risk of suicide or self-harm and take appropriate action to ensure safety. In the case of a suicidal inmate, my only course of action was to place them on a “watch,” at which time the individual would be stripped naked, with only a “suicide-proof” smock, and placed in solitary confinement. These cells consist of a concrete bed and a steel sink and toilet. The inmate on a “watch” can have no personal property to occupy himself. The conditions are a strange mix of sensory deprivation (absolutely nothing to do – no TV, music, no human interaction, stark cold concrete) and sensory overload (24 hour light, screaming, banging, stench). I struggled to uphold my ethical responsibility to ensure the person’s safety while knowing that the “safeguard” was psychologically harmful. It felt as though I was punishing someone who was asking for help. Furthermore, assessing for safety in order to “clear” the suicide watch was an equally difficult task. Inmates would say anything in order to get out of those conditions (who wouldn’t?). Not to mention what this process does to the therapeutic alliance. The number of inmates on “suicide watch” is small in comparison to those with mental illness who are placed in solitary confinement for prolonged and indefinite periods of time. I knew I had to do something. When I attempted to advocate within the facility, I was mocked, bullied, and had my clinical judgment called into question. I utilized supervision and sought out support from my profession, but found that little support was available. I tried to advocate for change indirectly through the local judiciary and the office of the public defender, all while having to walk a thin line due to issues of dual loyalty. I started to become mentally unwell myself. I started to experience anxiety, insomnia, and feelings of hopelessness. Finally, I resigned from my position and took to advocacy at the legislative level in my State. The concluding statement in the brief, “that the primary obligation of clinicians who practice in such settings is to provide effective and quality mental health treatment to those segregated inmates with mental illness” is misguided. It speaks to the lack of knowledge and understanding about the culture of corrections and the ethical dilemmas faced by correctional social workers. We are being asked to treat the psychological distress that is occurring as a direct result of solitary confinement. This is an impossible task. We know that clinical interventions are ineffective when basic needs are not met. Let’s try cognitive restructuring by helping the inmate to recognize and challenge distorted thought patterns, “Maybe if you change your thinking about your circumstances, you will feel better.” Or maybe we use behavioral activation, “if you increase your activity level in your cell, you might feel better. Here, complete this daily log for homework.” How about sensory grounding techniques or distracting skills to deal with distress? Oh, that’s right you are naked and can’t have any property. Although this Brief was meticulously researched and nicely written, it is completely out of touch with the reality of social workers providing mental health treatment to inmates held in solitary confinement. One piece of information conspicuously missing is the contention of Juan Mendez, United Nations Special Rapporteur on Torture, that solitary confinement beyond 15 days constitutes torture. Having worked as acting chief of Mental Health in the 500-cell solitary confinement unit on Rikers Island, I can personally attest to unspeakable suffering – head-bashing, self-mutilation, attempted hangings – that were the direct result of this grueling and inhumane punishment. The idea that social workers should provide “effective and quality treatment” to inmates in solitary confinement demonstrates an utter lack of understanding about this punishment. There are no words — and there are no pills that will counteract the effects of prolonged isolation. My job amounted to being sure that no one actually died from their self-injurious behavior. In the end, I felt I was little more than a monitor of human suffering – a far cry from the idealistic social worker I’d once been. There are thousands more who are now in my shoes and need the support of NASW. At a time when Pope Francis, President Obama, Supreme Court Justice Anthony Kennedy, and the United Nations are denouncing this practice, it is time for NASW to engage and grapple with this issue on a much deeper level. If NASW is to live up to its Code of Ethics, it can do no less. This is wonderful! Thank you, NASW, for recognizing this issue as urgent! I will be presenting a poster at the National Organization of Forensic Social Work Conference in New Orleans entitled “Evidence-Based Practice in Social Work: Women in Solitary Confinement”. Solitary confinement affects women differently in many ways and so little research has been done on this population in particular. There is such a great need for clinicians and advocates to help address the issues of solitary confinement….great job, NASW! Thanks for your positive response. We would love to see your poster. Thank you very much for your comments, Beth Ali and Greg! I am the convener of our Social Workers Against Solitary Confinement (SWASC) Task Force. We have been in existence since October, 2014, and are in communication with Mel Wilson and the NASW Board of Directors about ways in which we can work together to end solitary confinement. Mr. Wilson (Mel) is NASW’s liaison to our task force. As a member of an advisory board of the Vera Institute for Justice working on alternatives to solitary confinement, and with his knowledge, research and past advocacy on NASW’s behalf, Mel is invaluable to NASW and to our task force. We too are an asset to NASW as a task force, as we work to effect reforms to end solitary confinement as a brutal, ineffective and very expensive form of punishment. At NASW’s January, 2016 Board of Directors (virtual) meeting I briefly presented our task force’s requests for actions, based on the Memorandum we had written to the NASW BOD last August. As a result of the meeting, Mel wrote his Brief, which is most informative from the perspective of clinical social workers working with prisoners and in the community. In our Memorandum and subsequent Report, we have suggested ways in which NASW can provide educational, legislative and advocacy support to the profession, and we have offered our support and expertise. As matters now stand, social workers who work in correctional facilities with prisoners in segregated housing have no voice as “guests” in the facilities in which they work; consequently they are at risk of being harassed, ostracized or even fired. Two of our TF members resigned from their work in jails because of their ethical concerns around the issue of dual loyalty. This is a critical area, which we are advocating for NASW to address through its ethics resources. Our Code of Ethics demands no less! We invite you to learn more about SWASC by going to our web site at http://www.SocialWorkersasc.org, and/or by emailing me at moyaatk@yahoo.com. We welcome you and look forward to your involvement.. I just read the brief and am very proud of NASW for writing such a well-researched, quantitative, evidence-based document!!! Keep more of this coming, please! Pingback: SWASC | Will the social work profession assume ethical responsibility for the abolition of solitary confinement?